Frogger High Score Save Kit -- Plus Extras! NOTE: This kit only works on Frogger PCBs with the 36 pin edge connector and DC power. See Board Identification Guide. Installation of this kit is similar to other Braze Technology HS kits (replace CPU with kit). 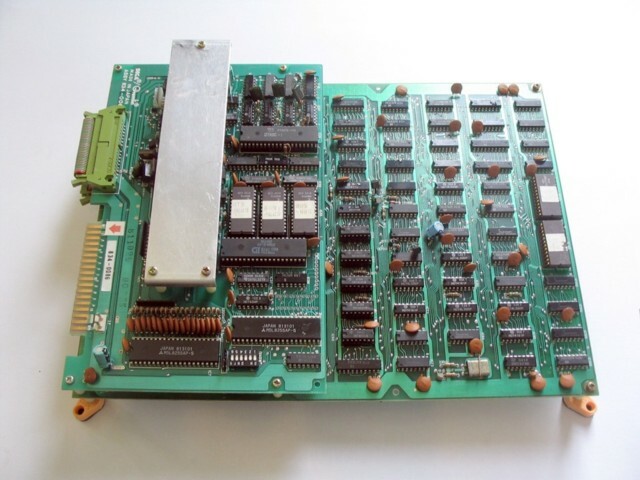 However some additional disassembly and reassembly of the boardset is required to gain access to the CPU. Additionally, some rearranging or replacement of the spacers is required in order to allow for extra spacing between the boards. See detailed installation instructions. Kit installs in just minutes. No board modifications or special wiring is required. No soldering required. See detailed Installation Guide. Top 5 high scores are remembered permanently, long after the game has been powered off. No batteries to replace ever. True "free play". No coins required. No need to open your coin door. Full (standard) attract mode while in free play mode. See screen shots. High Score Initials. A user friendly interface collects your initials for the high score table as found in other game such as Donkey Kong. 3 letters per score. Saved permanently along with the top 5 scores. See high score entry screen shots. Special high quality gold plated machined header pins on daughter card. Provides a perfect mate with your Frogger CPU socket. High reliability and strength for a long lasting connection. Daughter card snaps firmly into place. See picture. Extensive On screen test mode allows further testing of your PCB in addition to the automatic selftest. Allows testing of sound effects, background music, video sprites, video characters, and color maps. See test mode instructions. From the Seinfield eposide "The Frogger"
George and Jerry are in an old pizza parlor they used to visit a lot in the past and George notices the old Frogger game he used to play. The pizza place is going to be torn down and George discovers that he still has the high score on the game. George decides he must save the Frogger game so that the legacy of his high score can live on. Kramer recruits a character named Slippery Pete to assist in saving the game. Kramer uses caution tape to secure the area as best he can. But then everyone notices that time is running out on the portable power unit giving power to the game. Power to the game will be gone in mere minutes. With no caution tape left George attempts to move the Frogger arcade game across the street and to the nearest power supply. With the movement noise of the classic Frogger game, George moves in and out of traffic and attempts to cross the street. The game ultimately is smashed and another of George's dreams dies. GEORGE: (on telephone) I need a guy that can rig a Frogger machine so that I can move it without losing power, 'cause I have the high score. H-hello? The above extracted from movieprop.com and "Tom's Comedy Quotes".